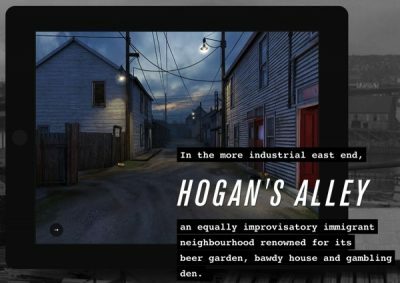 This summer, Double Dare worked with the National Film Board to remount their immersive installation “Circa 1948.” Co-created with Stan Douglas, the projection mapped environment recreates two historic Vancouver locations that no longer exist. The installation will be open to the public as part of the Hidden Pasts, Digital Futures arts festival. Be sure to check it out! Hours: Tuesday – Friday 1-7 pm, Saturday – Sunday 1-5 pm. Don’t have time to visit in person? You can see it at our project page here.